Justice Minister Livni vows to appeal the decision, is certain that it will be blocked. The Ministerial Committee for Legislation voted Sunday in favor of a bill that would annex the Jordan Valley and place it under full Israeli sovereignty. 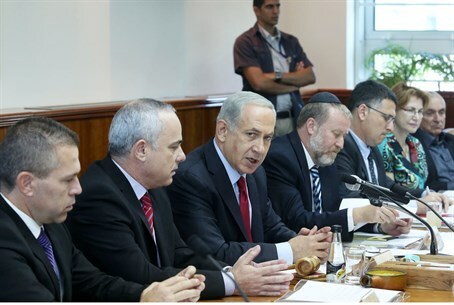 Four ministers voted in favor of the draft law, which was proposed Likud MK Miri Regev. Three opposed it. Minister Gideon Saar fired back at Livni, asking her “by what right” she is talking in this way. The Ministerial Committee for Legislation decides which proposed bills will enjoy the support of the Coalition. Bills it approves are likely to pass in the plenum. However, Livni's appeal means that the the Committee will vote on the bill again in the coming weeks. The Jordan Valley, situated in eastern Samaria (Shomron), has been the topic of contention in recent months. US Secretary of State John Kerry is reportedly attempting to force a deal on Israel and the Palestinian Authority which would see an Israeli "withdrawal" from all of Judea and Samaria, but allow for a temporary arrangement whereby IDF and/or foreign forces would maintain a presence in the Jordan Valley. The Israeli government argues the Valley is strategically important, and Prime Minister Netanyahu has insisted in the past that, in the event of a withdrawal from Judea and Samaria, Israel would still keep troops in the area. Calls by some nationalist MKs to annex the area are an attempt to forestall any withdrawal from the area whatsoever. Some analysts have criticized the idea that an Israeli withdrawal from Judea and Samaria would be "safe" as long as forces remained in the Jordan Valley, saying that the mountainous regions to the west and south are in fact even more strategically crucial for Israel's security.